Ish Monroe prevailed despite losing what might've been his biggest bite of the day. 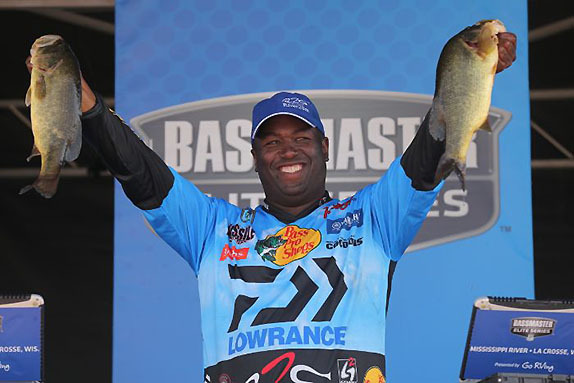 Ish Monroe claimed his third Bassmaster Elite Series regular-season victory as he caught a 16-02 stringer to triumph at the Mississippi River out of La Crosse, Wis. with a 4-day total of 65-07. His winning margin over runner-up Jacob Powroznik was 11 ounces, while day-3 leader Randall Tharp ended up 3rd, another 7 ounces back. Monroe was ecstatic and emotional as he collected his trophy from emcee Dave Mercer. He spoke of his close bond with his father and how he�d always taken him fishing as a young child and got him hooked on the sport. �Get your children hooked on bass fishing and they won�t want to do anything else,� Monroe told the audience. Once Powroznik took the lead, he chewed his nails short while waiting for the rest of the field to weigh in. At the end, he fished a brilliant tournament, falling short only to Monroe. His 16-11 stringer was the best of the final day and he concluded with a 64-12 aggregate. Tharp concluded with 64-05 (14-09 on day 4). Gerald Spohrer was 4th with 64-00 (14-14) and Jacob Wheeler completed the top 5 with 62-03 (16-10). Martens, who started the day an ounce behind leader Tharp, dropped six places as his fish decreased in both size and numbers. The weights and numbers produced by the field of Elite anglers exceeded all expectations as changing conditions and a constant influx of rising water left competitors constantly modifying their game plan day by day and sometimes by the hour. Looking back, the Mississippi River brought the most 3-pound bass across the stage that tournament director Trip Weldon could remember, a sign that the 12-pound average that was formerly required to cash a check there was a thing of the past. Monroe moved up from 3rd place after day 3 to claim the victory with a 16-02 sack. The circuit now moves directly to Lake Oahe in South Dakota. Practice gets under way Tuesday, with competition set to run Friday through Monday. 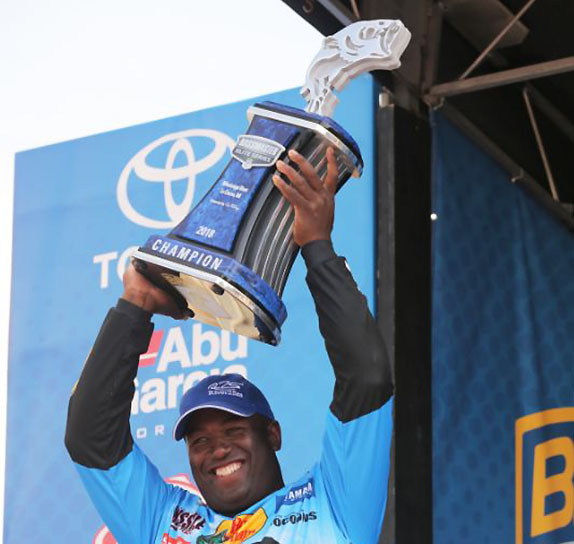 Though Monroe was confident he was on the fish to win, he took nothing for granted. �I knew it was going to be close,� he said. He fished calmly and stayed composed even after losing what could have been his biggest fish of the day when it was halfway back to the boat. The most difficult part of the day was at 10 a.m. when he started thinking of the fish he�d caught in other places days earlier and not packing up and leaving to chase them. �I knew the fish to win were in this spot,� he said. Jacob Powroznik had a big final day, but came up a little shy of victory. He stuck with his program of fishing a River2Sea Ish Monroe Phat Matt Daddy Frog around slop mats and reeds. Details of his winning pattern, as well as those of the other top finishers, will be published soon. Powroznik caught more bass on day 4 than many anglers do in a year � or 2. �Today was the absolute best day of bass fishing that I�ve ever had in my entire life,� he said. Like the previous days, he returned to the same 3-by-3-mile area, put his MotorGuide trolling motor down and worked each piece of visible cover and matted vegetation. Today, he noticed some tiny frogs sitting on the matted vegetation and slop. His best bites were in such areas, but it also provided quite the spectacle as he watched countless bass erupt on them throughout the course of the day. In the end, he was confident in his plan and has no regrets. He threw a Livingston Freddy B Tournament frog and other brands he didn't name. �When you go to (La Crosse) in June through September, if you aren�t fishing a frog you're messing up,� he said. Tharp is proud of his reputation of being a closer when having the lead heading into the final day. Not sealing the deal left a bad taste in his mouth, but he�s content that he did all that he could to win the event. 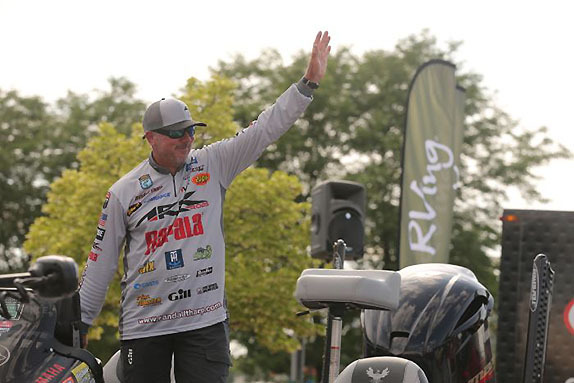 Randall Tharp was disappointed that he couldn't close out the victory after starting the final day with the lead. Though he didn�t win, he�s proud of the decisions that he made this week, especially scraping his plan toward the end of day 2 which led him to taking the lead on day 3. His only regret is that he didn�t ditch the area sooner for the place that eventually took him to the final day. The toughest factor for Tharp was not knowing what the current would do to the behavior of the bass. That led him to continue to practice during the event; after all, the river became a new body of water each day due to the rising water. Spohrer felt good about his finish but couldn't help wondering if some of the fish he�d lost during the tournament could have affected the end result. Spohrer aimed to catch 16 pounds a day for the first 2 days of the tournament and then slowly ramp it up toward the end. He was carefully managing two areas but fears he may have leaned too hard on his big-fish area on the third day. He shudders to think how much fishing time he lost while having to contend with locking between pools. �Each day, I had to leave fish while they were biting. I was on the winning fish and had to leave them." He carefully built his game plan around a 5-hour window of fishing time each day and how he would best cover the water he needed to efficiently. With the bass not as interested in the frog early in the morning, for the first time during the tournament he fished a 6th Sense Dogma walking bait on day 4 that produced fish toward his limit. Toward the end of the day, he acted on a hunch and made a 24-mile run that he hoped would produce the necessary kicker fish that would solidify his limit, but it wasn't to be. 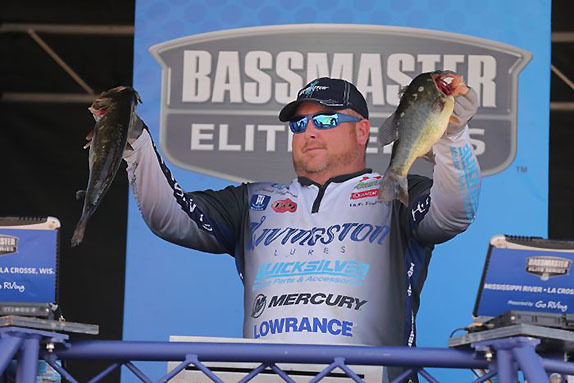 After getting stuck on a sandbar at the Sabine River event and placing 68th, Jacob Wheeler came into the Mississippi River event looking for a little redemption. Mentally, he tried to prepare himself for what the fish were going to do as the water continued to rise. He was careful to catch a limit each of the first 3 days and the searching for new areas and patterns. Today, he caught 25 fish and they were the right ones as he moved up one place from yesterday to crack the top 5. He ran three different patterns and believes it was a part of his success. �I wasn�t locked into one area or pattern. I rotated through my usual holes but I also expanded each day with new stuff." As other anglers commented, the rising water continually unlocked new areas that were untouched. He figured that many of the bass he caught on day 4 had yet to see a lure. > Day 4 stats � 12 anglers, 12 limits.